Superliga Invitationals on - Sta. Lucia Land Inc.
COCOLIFE and Sta. Lucia Realty will try to make a statement when they face separate opponents in their Philippine Superliga (PSL) Invitational Conference debut today at the Filoil Flying V Centre in San Juan City. The Cocolife Asset Managers, led by former collegiate rivals Michele Gumabao and Denden Lazaro, take on a revitalized Generika-Ayala side at 3 p.m., right after the 1 p.m. opening ceremony. The Sta. Lucia Lady Realtors, meanwhile, make their comeback in the Philippine sports scene this time in volleyball as they face favorite Petron at 7 p.m.
Petron included ex-De La Salle star Mika Reyes and Rhea Dimaculangan to their already formidable roster. Grand Prix champion Foton, which acquired San Sebastian College star Grethcel Soltones, battles a stronger Cignal led by former Army players Rachel Daquis, Jovelyn Gonzaga and Honey Royse Tubino, at 5 p.m.
Six teams are seeing action in the Invitationals. They will play a single-round elimination with the top three advancing to the semifinals, where they will be joined by Japanese team Kobe Shinhua University. Attention is expected to be focused on Gumabao and Lazaro, both former stalwarts of De La Salle and Ateneo in the University Athletic Association of the Philippines. They will be coached by Obet Javier of National Collegiate Athletic Association champion Arellano University, with many-time national player Tina Salak serving as one of the assistant coaches. 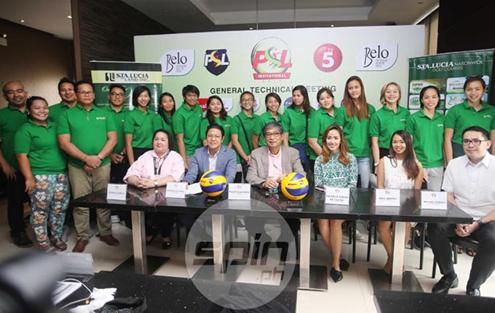 The Lady Realtors, on the other hand, are hoping to keep the winning tradition Sta. Lucia Realty booked in the Philippine Basketball Association from 1993 to 2010 it highlighted with a title run in the 2008 Philippine Cup. “This is a very young team, but we believe our team is very hard working and the players are playing with a big heart,” Sta. Lucia team owner Michael Robles said.